On June 16, after breakfast we set out to visit the volcanic islands of Nea Kameni, meaning ‘new burnt’ and Palea Kameni meaning ‘old burnt’. During the Bronze Age, Santorini was called Strongyli, meaning ‘rounded.’ Devastating volcanic eruption of 1650 BC resulted in decimation of Strongyli, creating the crescent shaped Santorini and several surrounding islands. The island of Hiera was formed due to volcanic eruption which started around 197 BC. In 47 AD the volcano reawakened spewing huge quantities of magma forming a new island which merged with Hiera to form Palia Kameni. Breakup of Palia Kameni occurred between 1457 and 1458, as per Roman historian Aurelius Victor’s ‘Historia Romana’. At that time the island had a perimeter of 5,550 meters. It gradually acquired its present shape through fragmentation by great cracks and collapse of its shoreline, with the current perimeter of only about 4000 meters. Like a slumbering demon, the volcano remained dormant for the next seven centuries. It became active again, very violently in 726 AD. Nea Kameni is Eastern Mediterranean’s youngest volcanic landform. It is a protected natural monument and national geological park. In 1573 AD, about 65 years after Palea Kameni reached its present form, volcanic activity broke out resulting in the formation of a small island called Mikra Kameni meaning ‘small burnt’. Formation of Nea Kameni commenced with the volcanic eruptions from 1701 to 1711. Volcanic eruptions of 1866 to 1870 caused the smaller island of Mikra Kameni, to be joined with the larger Nea Kameni. 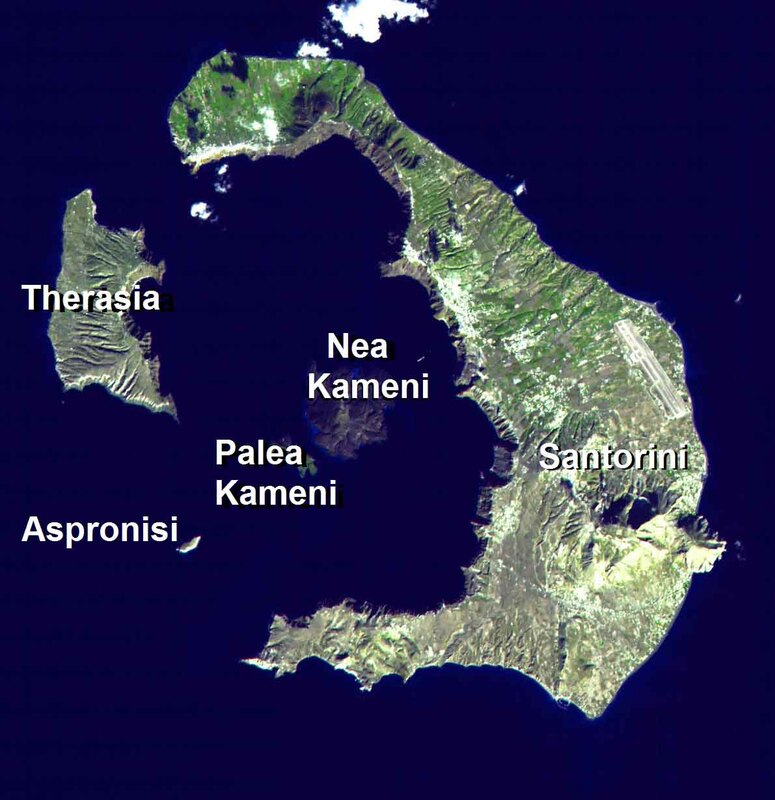 During the period 1939-1941, many eruptions occurred in Nea Kameni which changed the topography of the island. The volcanic activity ended in July 1941. Today, magma exists at depths of a few kilometers, giving Nea Kameni its trademark sulfur odour. 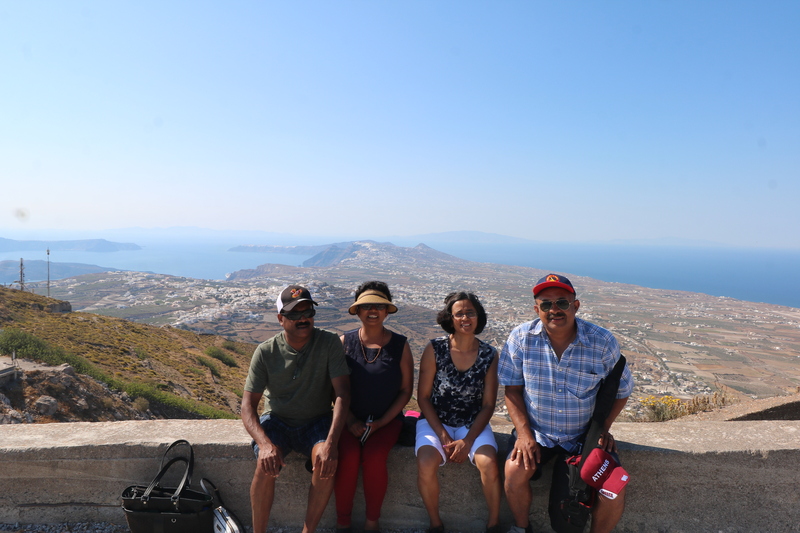 From our hotel we rode a local bus to Fira, the capital of Santorini on the West coast of the main island. 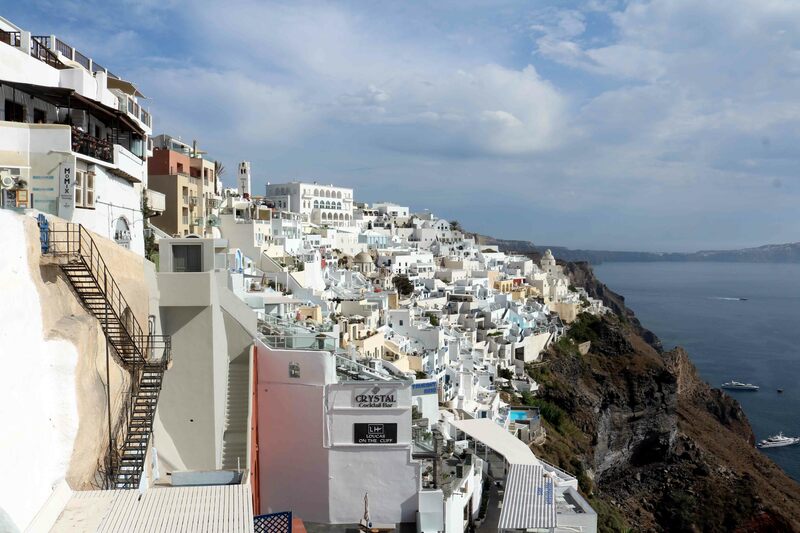 Fira is a ‘whitewashed’ town of cafes, bars, restaurants and shops, all filled with tourists. 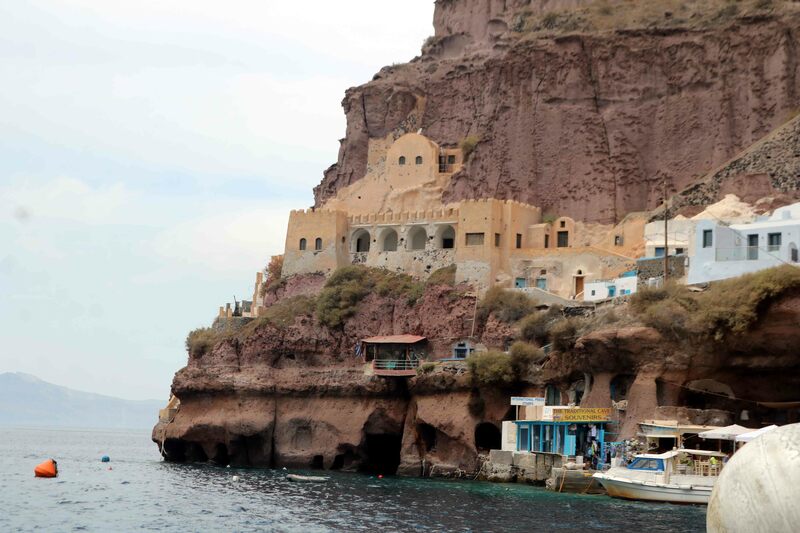 We had to now go to Gialos, the old port of Fira to sail to the volcanic islands. Till a few decades ago, Gialos was the main commercial port of the island. The port now is active mostly in summer and serves only the cruise ships, the excursion boats to the volcano, and a few fishing boats. The port is located about 275 meters below the cliff. Alighting from the bus, we walked to the cable-car terminal to purchase tickets for the ride to the port. The queue was pretty long and we got our tickets after about 30 minutes. The ladies made use of this time to buy trinkets and memorabilia from the shops around, while the men stood in the queue. 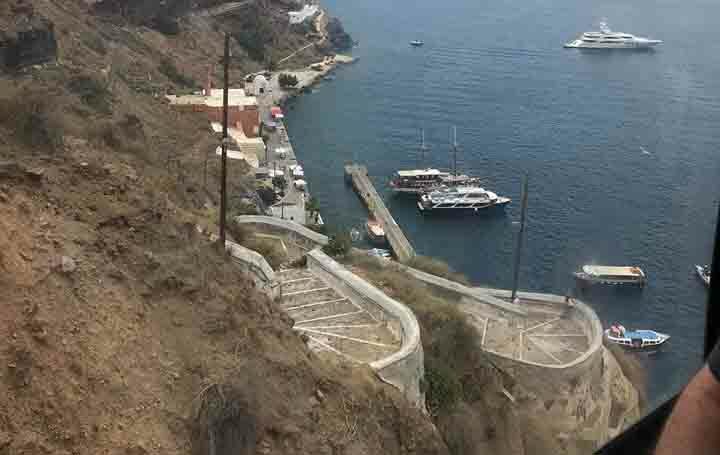 There is a zigzag track of 588 steps called Karavolades stairs from the Fira to the Old Port. There were many tourists walking up and down these steps. There are mule-taxis, that operate on the same track, taking tourists up and down. The Karavolades stairs have several large bends which offer magnificent view of the volcanic islands. The fastest option to reach the old port is surely by the cable car system, commissioned in 1982. The project was funded by Loula & Evangelos Nomikos Foundation created by the wealthy Santorini ship owner Evangelos Nomikos. He mediated with the traditional mule drivers who were operating here and ensured that a part of the income went to the mule drivers and the rest to the city. The cable car runs every 20 minutes and a single ride takes 3 minutes. 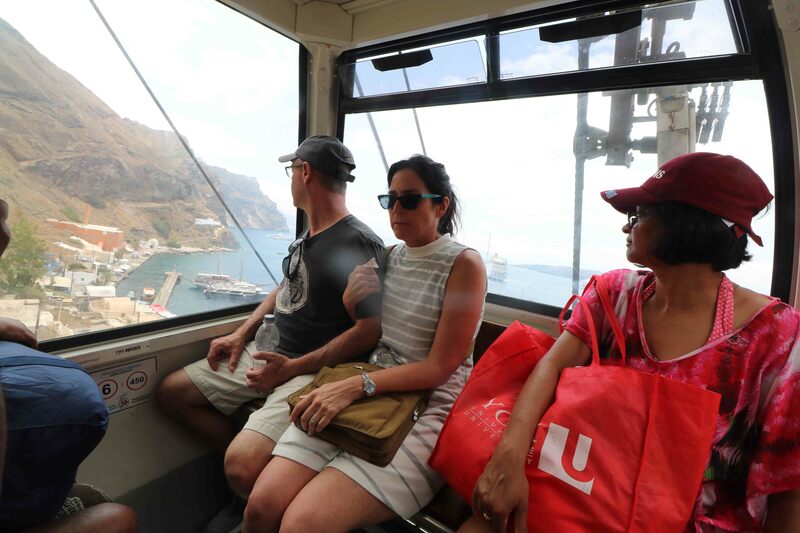 The cable car ride to the old port gave us a stunning view of the volcanic islands, bizarre cliff sides and still blue waters. On all sides of the old port were restaurants, taverns and small shops, mostly catering to cruise ship tourists who come ashore by chartered boats as the huge cruise ships cannot berth at the harbour. At one end of the port is the caved houses that appear stuck on to the rock and rock caves that have been created by erosion. We booked our tickets for the boat journey to the volcanic islands and had lunch at a restaurant at the pier. We set sail on a boat from the port at around 2 PM to the island of Palea Kameni. After about 20 minutes, the boat anchored at the cove of Agios Nikolaos. 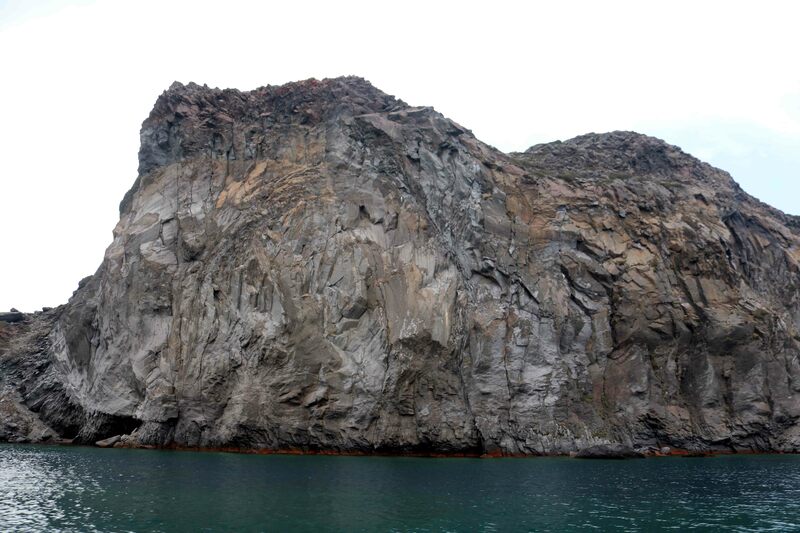 As we came closer to Palea Kameni island, we were greeted by steep cliffs formed by solidified lava. The cove is formed between small cliffs filled with solidified lava rocks. 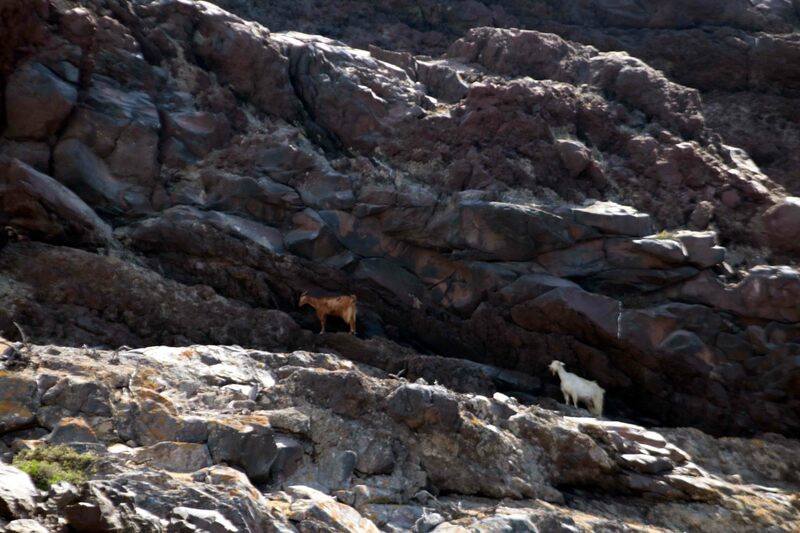 The island is uninhabited, but we saw goats grazing, presumably wild, miraculously perched on the ledges on the cliff, chewing away on the almost non-existent shrubbery. The boat anchored about 75 meter away from the hot springs. We had to jump seven meters from the boat deck, plunging into deep cold sea water which is greenish yellow and then swim for about five minutes towards the orange coloured hot springs. (Attempt this only if you are a good swimmer.) 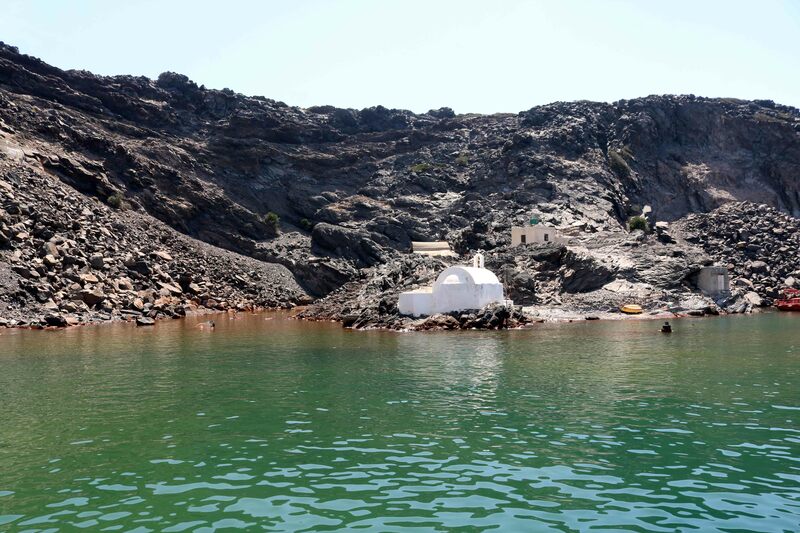 At the mouth of the hot springs stands a little Greek Orthodox church dedicated to Saint Nikolaos, the patron saint of sailors in Greece. 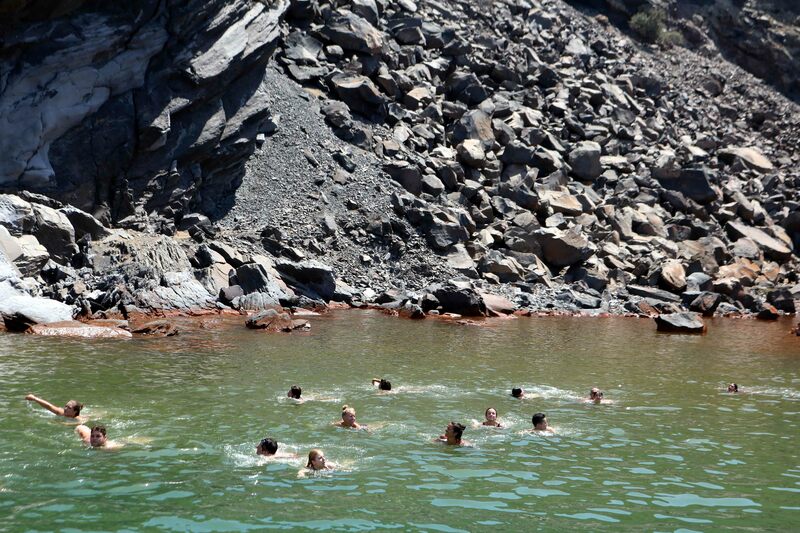 Due to volcanic activity in the cove area, the water is warm and rich in sulphur, iron and manganese. This gives the water an orange colour and is believed to have therapeutic benefits. As one swims closer to the cliff where the water is orange, one can feel the increasing water temperature. It is slightly warm and there is no fear of getting burned. The seafloor around the hot springs is muddy, rocky and slippery, making it difficult to walk on. After about half hour stay at the cove, a swim in the warm waters, a view of how the earth would have evolved, the boat steamed off to Nea Kameni, the younger sister island of Palea Kameni. A very informative article sir and lovely pics as well. I know where I am planning my next trip to.